Matthew Williamson for Impulse tie neck blouse (similar here), Thrifted American Apparel cutoffs, Tri-zip satchel c/o Rebecca Minkoff, Uniqlo capeline hat (also seen here), Elizabeth and James suede booties (similar here), Knuckle rings from La Di Da Dee Brooklyn, Scosha cage cuff. Anyway, hope your weeks are all off to a great start! 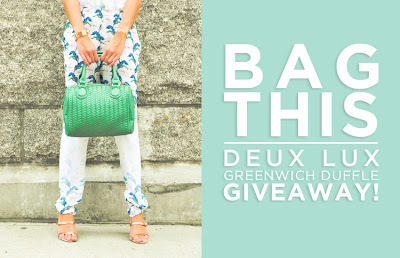 Also, don't forget to enter our Deux Lux handbag giveaway before it ends this Friday! Because really, who couldn't use another handbag? Your outfit is outstanding. Love the color of that top. This look is flawless, especially the hat add a very regal touch. Ohhh, that top is the most cute thing!! And I also love your hat, really perfect! Fabulous photos and outfit! I love this color on you. My goodness you look beautiful! Love everything about this outfit, from the hat to the blouse to the shoes. Awwww, cute doggy! LOVE that top on you! i love this look! <3 so gorgeous! ooh chic outfit and I love your top, the color is so pretty and stands out! Beautiful hat - it will also be great for fall! such a cool look! those shorts are great. You look stunning! Thanks so much for stopping by my blog! I'm following you now :) feel free to follow back if you would like! Such a gorgeous outfit! I want that hat!! Wow those photos are stunning! You look amazing & I love every piece you are wearing! Gorgeous!